These public gardens were first established between 1857 and 1862 and were designed by Giuseppe Balzaretto as a green town district. This district, situated in the central zone of the city, rests between Porta Venezia, Corso Venezia, Via Palestro and Via Manin. It is a typical, botanically rich English garden. Was designed by Emilio Alemagna and rests between the Castello Sforzesco and Piazza Sempione with the Arch of Peace. It contains the Napoleonic Arena, the Aquarium, the Tower, the Art Theater, which is called Triennale and the city library. This beautiful park has a little somethign for everyone. The grounds, speckled with ponds and romantic bridges, contains play grounds for kids, a relaxing place on the grass for young people and multiple outdoor areas and museums in which to take a stroll – come enjoy! The entrance is at Via Corelli No. 124, which starts in Via Argonne and Viale Forlanini and goes to the Idroscalo. 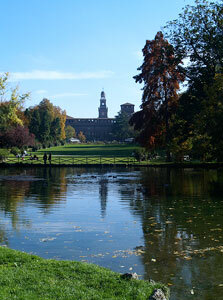 It's a large park of 235 hectares remains the biggest green space in Milan. You'll find quite a few ponds a rolling green hills. This garden, situated in Via Palestro 16, is a little English garden with a romantic interpretation of nature and classical elements. Named after the street it rests on, this park began as an aristocratic garden and boasts a calming fish pond in its center. This large park is situated in Via Feltre, and contains a large number of natural elements. between the streets of Viale Gabriele D’Annunzio and Viale Goriaza. This part of the city contains the Darsena Basin, which is where all the channels and rivers of Milan meet and where the Olona River, currently subterraneous, and the Naviglio Grande merge. The Darsena was constructed by the Spanish Earl of Fuentes in 1603 to enhance the transport of goods. is part of the Darsena Basin and merges together with Ticino after 33 km. It was built In the 13th century by Gian Galeazzo Visconti, but wasn't actually finished until 1819.
has its source in the river Ticino in Tornavento. The channel was important for the transportation of the marble used to build the Duomo.